God Will Bring It To Pass! What a rewarding time for us in this part of our ministry! It is a time where many things that have been in my heart for years, almost 20 to be more precise, are coming to pass. Desires that God gave me and I have pursued and prepared for are now manifesting. Our God is faithful. He who began that good work will complete it. What an honor we have to be chosen as co-laborers with Him. I say these things to encourage you who have desires that God has placed in your hearts. He will bring those things to pass in His time and for His glory to flow in this earth. When I returned to States after my first missionary trip to Honduras, I had a deep desire to return to help the children with disabilities and their parents, particularly those in the villages. At that point I did not have any education in teaching or special education and was a stay at home mom of 4 young children. The following years God guided me into preparation for the future in the ways that I did not realize all that He was doing. Now I am carrying out those things that God put in my heart 19 years ago. I marvel at His work and plan. Two weeks ago we began a group for parents and children that meets weekly. In our time together I teach them about being a parent of a child with special needs, discipline, education and most importantly, I teach the Word of God to them. I teach them about being in faith for their children, their families and themselves. I share scriptures to build their faith and so they will know of God’s provision and love for them and His desire and ability to give them victory in all things. We are also able to demonstrate how their child is learning and special techniques to use with them to get them involved in their lifetime of learning. Having a child with a disability in Honduras can be a cause of great shame. Many churches teach that it is because of their sin that the disability was given to their child. God never put a disability on anybody. Only good comes from our God. We know the Word of God will bring much deliverance, freedom and a new hope for them and their children. We want them to be able to get a vision of the potential their child has and help them reach it. I also want to share about the Kinder in the picture above.This is Rosa’s Kinder. I am so excited to be working with her school. Rosa is a wonderful Christian mother of 4. She and her family live in the village of Porvenir. Her husband works in the pineapple fields. They do not have much but they walk in faith and have seen God always provide for them. Not only have their needs been met but they continually give to others. Rosa opened a Kinder which now serves over 30 students whose parents are unable to pay. Rosa does not receive any salary or financial provision but simply donates her time and life to the school. Rosa had been teaching the children in her house which is a very small cement block home, but God spoke to a visiting pastor to build a school room for her and they are enjoying it. When I first came to her school I was amazed at her gift to teach the children and guide their learning. The classroom is colorful, fun and full of learning visuals. Rosa had requested me to come and help her with several students who had learning challenges, including spina bifida, low cognitive levels and fetal alcohol syndrome. Each time she and I are together we have church, excitedly sharing the Word with each other and what God is doing in our lives. What a joy to be able to help a teacher walking in faith for her students. These families have challenges we in the States are not confronted with. One student who barely communicates suffers from learning challenges but also from lack of food. His mother suddenly left the family last year. The little boy is with the father, who has to travel with his job that barely leaves money for food. When the father travels the child stays with his grandmother who does not take care of him. Recently the child went for a week without food. Neighbors and family are concerned but many are dealing with their own lack and needs. Another student who has spina bifida can walk and learn but needs diapers and closed shoes. Diapers are way beyond the mother’s budget and the little girl only has an old pair of Toms that are ripped and split. I plan on buying shoes for her this week, but please pray for these families and the children. Pray as we minister the Word to them that it will be received that they may receive God’s joy as they receive His goodness of care for them. Again, thank you so much your financial contributions for us to be here. Your giving is an important part of this ministry. Dios le bendiga! God Bless You! Unlocking potential…..continuing what Jesus started. While sitting here at my desk this afternoon I’m taking in the wonderful aroma of a summer rain and feeling so blessed. Seemingly out of nowhere the tropical downpour began. Immediately a coolness replaced the La Ceiba heat and the fragrance of rain seemed heavenly. At church yesterday someone spoke of the fragrance of our sacrifice of praise rising up to the Father. I wonder if it smells like the summer rains. As God has asked of me what would seem to be sacrifices during my life, I have come to discover that from heaven’s perspective God’s requested sacrifice does not result in having to do without but rather it is an exchange for the indescribable goodness of God. It opens the door to walk in His world. Throughout the Bible and our lives God is constantly revealing to us that His purpose through us is greater than our and other’s perception of ourselves. That is central in the purpose of Seeds of Love IM. Through our sacrifice and work with the teachers and directly with students God is working through us to help others to realize that all have a God ordained purpose for their lives and have special abilities. Last week I was at a new school/English project in a nearby village. I was training volunteers that help the children in the village learn English. I had spent some time preparing a power point presentation and hand-outs on the practical information. The power went out in the city just an hour or so before I was to leave. I was so grateful that I had purchased a mini projector with a battery. Technology is so great at times, especially when it works! So, even with the absence of electricity the presentation was easy. This week I will be working with their Kinder program which is in Spanish. I am so enjoying sharing what I have learned and to see the help implemented in the schools here is so rewarding. Next week I will be meeting with the “school superintendent” for this area. This will open the door for access to all the public schools here. God opens doors and we are seeing those doors open now. I believe that God is also sending others to help so that more help and support can be given. The picture above was during a recent day in a village school. 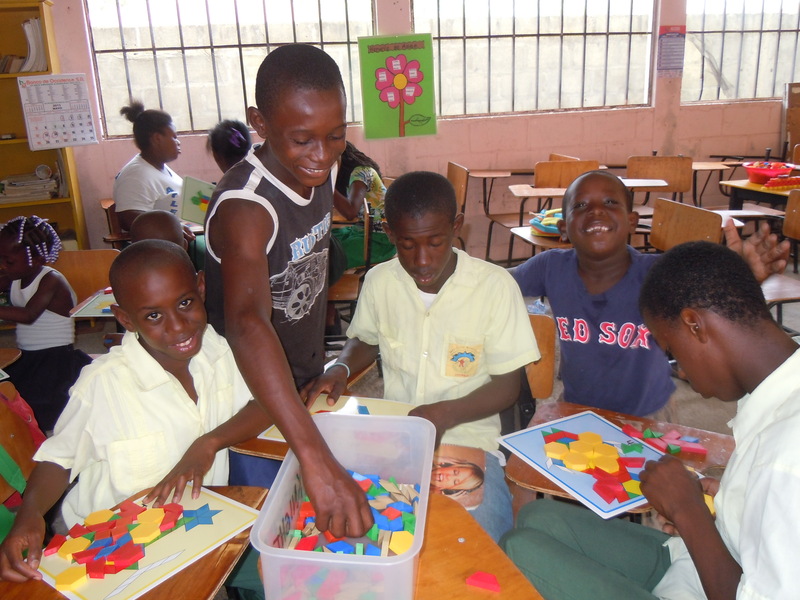 The students and teachers had never seen learning manipulatives like these attribute blocks. Through modeling we showed how to use these fun things to learn and to bring out the student’s abilities. The students experienced pride in accomplishment. They are learning about their potential. Thank you for your sacrifice and support to make this ministry possible. If you are not presently financially supporting this ministry, we would ask you to consider a monthly donation to enable us to work here. The need of the people is great. Last week Katie Ziegler traveled to La Ceiba with my daughters, Jill and Kenzie and myself for a week on the mission field. It was a week of serving in the school for special needs, serving in the jungle hospital in Rio Viejo and exploring a new country and culture. Katie, Jill and Kenzie were a blessing to Honduras. Jill and Kenzie shared with Katie where they had spent 6 years on the mission field, introducing her to new foods (sugar cane, frijoles, pastilitos, and banana soda) and sharing experiences of the La Ceiba heat, mountain roads, seeing the horse drawn carts selling bananas and experiencing the Honduran traffic. We also had a fun day of snorkeling off the coast of Cayos Cochinos. Sunblock was essential and all were thankful for it. We were able to teach in small groups in the school and were so proud and pleased with the student’s participation and excitement. At the jungle hospital, Katie assisted Dr. Martin Williams, aka JungleDoc, with a 6 day old baby, helped in the pharmacy and gave new clothes to a little boy from a nearby village. A great week with great company and a great time serving a truly great God. Meet your Christian Family at Iglesia de las Naciones! My family and I are learning more and more each day what a precious gift our church family is to us. For those of us who have chosen to be closely connected with our Christian brothers and sisters in the local church we are experiencing a fuller measure of God’s redemptive power and provision for completeness. It is part of God’s design for His body and our connection is necessary for His power and Spirit to flow in purity. My pastor and home church are a central part of my life. As a missionary I also get the wonderful blessing of being connected to other local church bodies. I love the body of Christ. I love it when we come together and experience more of His completeness. We need each other and can only grow when we are moving together. The unity of Christ’s body is vital for God’s love and salvation to come to this earth. 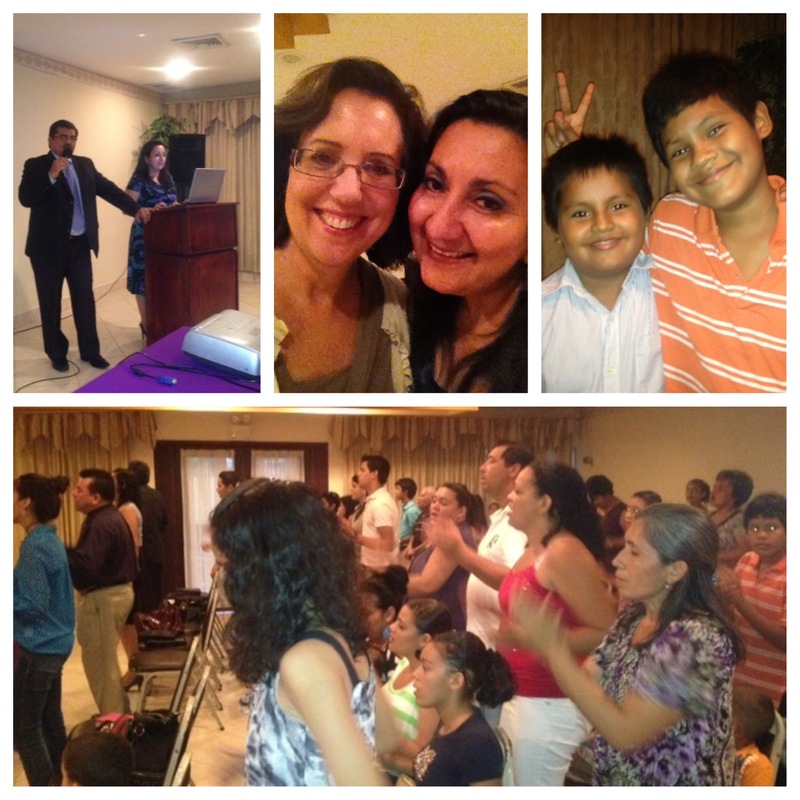 I want to share my church family in La Ceiba with you. They are called Iglesia de las Naciones (Church of the Nations) and are pastored by Edgardo and Olguita Lainez. We started the church in April of 2005. Pastor Lainez’s vision is to raise up, help equip, send out and support missionaries to go to other parts of the world who have never heard the gospel, especially those of the Muslim world. The church members adopt a remote people group in the world each month and pray for their particular needs and salvation, for help to be sent and for the needs of the current missionaries. Although we may not be able to see from here the impact of their prayers, we know that the effect is great and sure. (The earnest (heartfelt, continued) prayer of a righteous man makes tremendous power available [dynamic in its working. James 5:16 AMP) The church regularly holds missionary conferences for pastors and leaders, church congregations as a whole and special missionary conferences for children. They are endeavoring to raise up a generation that will go and make disciples (Matt 28:16). Please pray for Iglesia de las Naciones that the fullness of God’s blessing flow upon and through their body and each of their members. Pray for angelic protection as they are living in a time of much criminal activity in Honduras. Most importantly pray Eph 3:16-20 over the Christians in Honduras that their hearts be enlightened with the gospel, that they will know what has been given to them in their salvation and that they may receive and walk in His power in all of it’s fullness to bring His glory to Honduras and the world. As I write this, my heart is full with the desire for His redemptive power to invade this earth. It has invaded. It is in us. We are going. Thank you for joining with me to provide the finances and the prayer support to go. You are in integral part of this ministry! Thank you for your time in prayer for this work where God has called us. Now on with the work to bring God’s glory in the church. It’s Back to School and Everyone is Happy! There had not been special classes in Corazal since the new school year began in February as the Honduran government has not been paying many of their teachers. Teacher strikes have continued. When there are strikes, the strikers usually take over the bridges going in and out of town. The other day I was leaving to make the 3 hour drive to San Pedro Sula with another missionary to purchase items not available in La Ceiba. We arrived at the bridge on the outside of town and saw the large group of people on the bridge unfurling large banners. No cars were allowed to move and we were the second vehicle not able to pass over the bridge. We were so close! Only a few seconds early we could have made it! Gathered around the area were several of the national police. We waited hoping that they would break up the demonstration. Many buses were stopped as were many people on their way to work. But after awhile, we turned our truck around and headed back into town as no intervention was made. Flexiblility is an important skill here. Still hoping for a resolve we headed to a coffee shop to wait it out and had a wonderful conversation about God and the powerful way His Spirit is moving during these times. As we both shared the Word of God with each other and what we were hearing in our spirits we were recharged with excitement for ministry. The strike didn’t end in time for us to make our trip, but we began the rest of our day so refreshed and encouraged in the Lord. But back to the classes……The teachers from Corazal were able to meet with some of the administrators that day and there are now plans for an administrative visit to review the school so the teachers have opened the school again. They are woman of faith and are believing for favor with the government so the children with special needs in that village can continue to receive an education. Without that school, there is nothing else for them. This picture was taken on their first day back. Jeny, one of the teachers had called me early Monday morning to share that classes were beginning. I rushed to get ready and was so happy to be there with them. Please pray with us for those with the Ministry of Education’s hearts to be impacted to resume paying the salaries for these teachers. Buy a Bracelet! Provide for Special Schools! 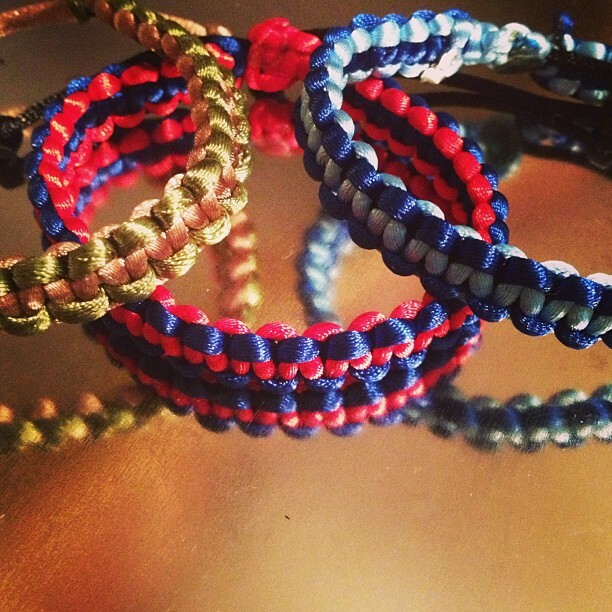 Jill had the vision of making these color bracelets to raise money for the children in Honduras while we were living there several years ago. A Honduran girl who was in the church in La Ceiba taught Jill how to make these bracelets with a material called “rattail.” In December she began to sell them with the original goal of purchasing and installing metal locking doors for the classrooms in Corazal. Can you imagine a classroom without a locking door? 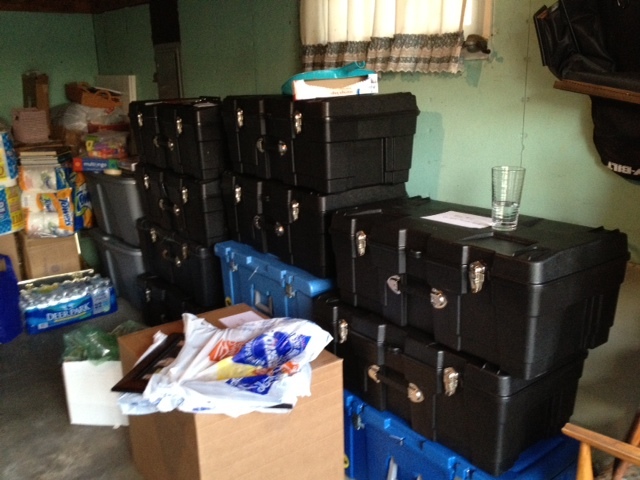 To our astonishment we were able to raise enough money to provide 5 doors within a few weeks. Thank you to all who have purchased bracelets from New Albany, Indiana, to Georgetown, Texas to Jamestown, New York to Nashville, Tennessee. While Jill and I were in Georgetown, Texas in January one individual donated the funds for 3 doors! We are so excited to be a part in helping this school. Our next project is to provide a bathroom for the school and security gates for the front and rear entry to the school property. What a joy to see God provide as only He can. If you would like to purchase a bracelet. They are only $3.00 and come in a variety of color combinations. We will mail anywhere in the United States. Just contact us by email: info@seedsofloveim.org. God Bless You! It is Christmas! It is time to celebrate and share! Christmas is here in Honduras! The Christmas tree in the mall is all up and decorated with huge ribbon and ornaments. Stores are more crowded than usual and during a trip to Diunsa, my favorite store in San Pedro Sula, I was in the midst of many serious shoppers plowing through the bright shiny decorations. The States has nothing in the bling category to compete with the Christmas decor in Honduras. Pretty and shiny. But the season is much more quieter here. much less stressful and more time to spend just enjoying each other. 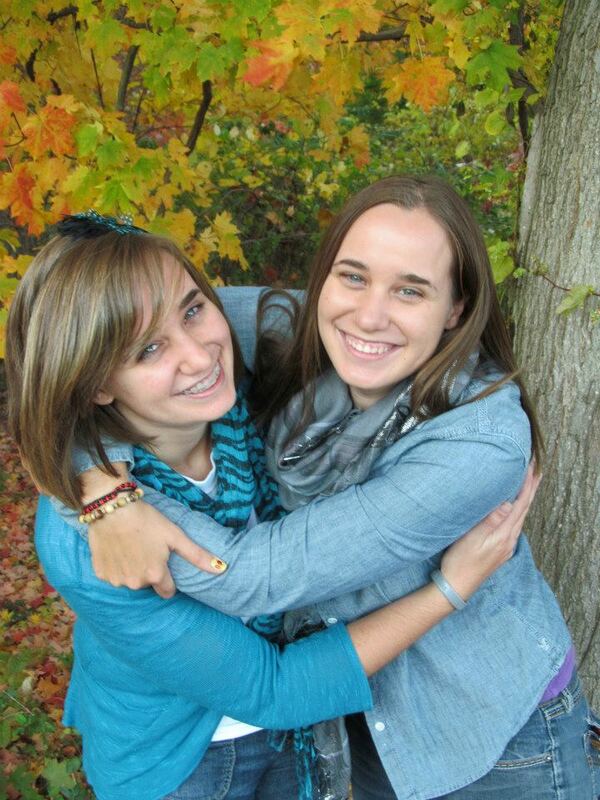 This year I get the best of both places as I will be with my children for Christmas in the States. I’m so excited about returning for Christmas with family and friends but am already excited about returning to my work here. Every day I am thanking God for allowing me to be here and working with the people here. The rains continue and there are a few buckets positioned in my house to catch the drops that have managed to come through the roof. This is a common problem in La Ceiba during this time of year. The road that goes up the mountain has been a mess. It is like driving on ice and snow in some places because of the deep slimy mud. I have appreciated the 4-wheel drive. Parts of the road have washed away while much of it is a one lane path, but when you can take your eyes off of the mud you get a wonderful view of the Cangrejal River. It is fuller, a little noisier and was beautiful today as I drove up to a village. As I was driving through a village today, I saw a young man who has some mental and physical disabilities. He has been blessed to be living with a missionary family here. He collects recyclables. What a blessing to see. Usually persons with disabilities are begging at the city intersections and at the entrances exits at the mall parking lot. Here, there is no disability check, no special governmental programs, no Medicaid, no group homes or assisted living. Many live on the streets, are kept in homes because of the shame attached and are taken advantage of. John 10:10 says that Jesus came to give us all an abundant life. He came for them also. This season as we are all enjoying the abundant life that Jesus came and gave His life to give us, let us allow God to us to bring the news of the abundant life to others who aren’t able to experience it yet. Someone came to tell us. It is now our turn! Merry Christmas! One of my favorite things during Christmas is the huge Christmas tree in the mall. 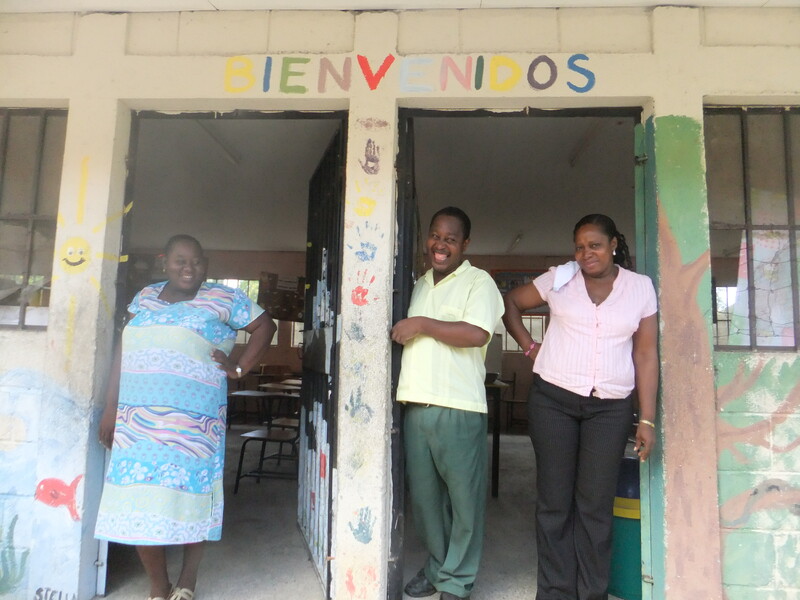 This is Yamileth and Yeni, the teachers at Un Nuevo Amanecer,the Corazal School, with one of their students. I so appreciate their love for the students and love working with them. They are both Christian ladies who are faithful to come every day to teach even though they have gone through months without receiving any pay from the Honduran government. 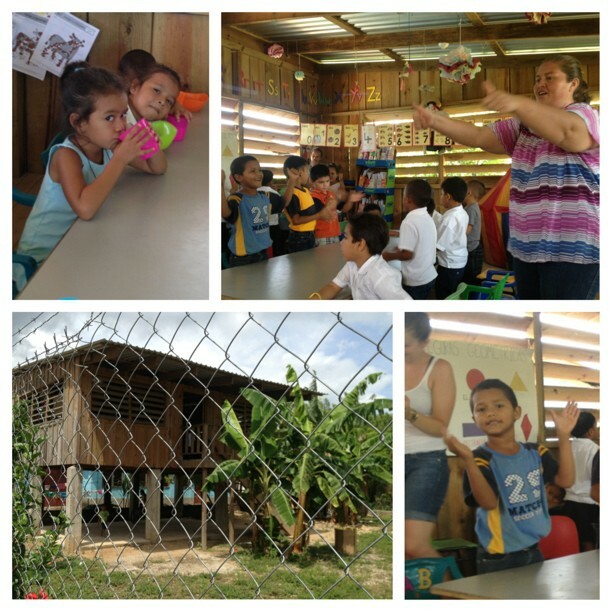 The school is on land donated by the Corazal community and was also built with donations. Yeni and Yamileth, who are single mothers themselves, seek help for more construction and supplies as the Ministry of Education in Honduras does not provide any. They currently are trying to finish two classrooms and two bathrooms. Before this school was here, there was no help for 130 + children with special needs that live in this village. But now there is a place where they can learn and receive love, a safe place. I am helping Yamileth and Yeni with training, resources and in working with the students. There is always a lot of joy and things going on at Un Nuevo Amanecer.